Has your regular yoga practice slipped a bit through the holidays? Celebrate the New Year by restarting your home yoga practice; you can find a practice to take care of any part of your body, of your energy and your mental state on Sequence Wiz website. 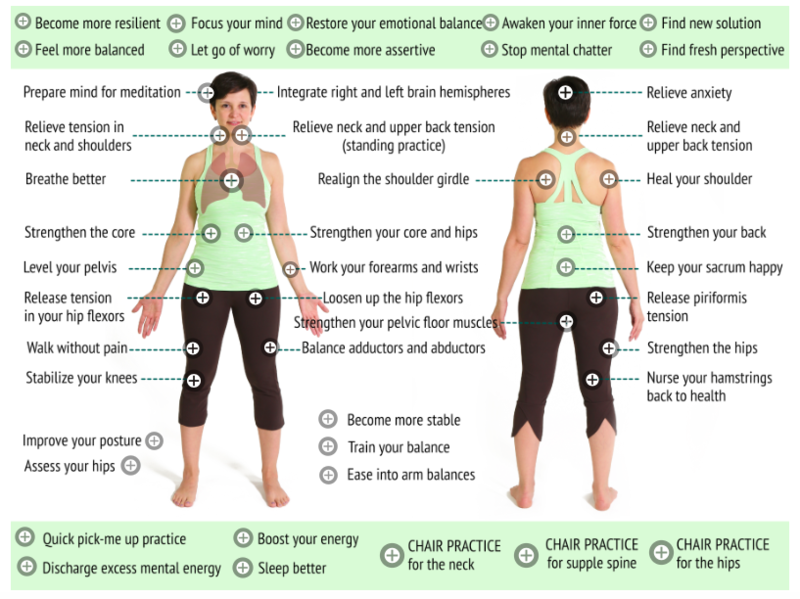 We have recently updated our Body Map for Yoga Practices with the latest practices. Now it shows links to all the practices we have. A little pop up window will show you the name of the practice and some information about it. Click on the window and you will be taken to the practice page. We hope this helps you find the practice that you are looking for much faster! Click on the image below to go to the map. You can always find the Body Map by clicking on the link in the top menu. I don’t speak (write) english, but I understand your lessons. The last 3 yars I read your articles. It inspire very much my practice as teacher and my own. I teach yoga for seniors. I admire your generosity when you share your enormous experience. Thank you very much. Olga, this is brilliant. You continue to provide consistently useful, easily accessible, and high caliber content on your site! Congratulations and thank you from all of us who appreciate having this treasure trove of work available to us! Thank you for this, Olga. It’s a great tool that I’ve used often & now the updated version is even better. Best wishes for 2019!